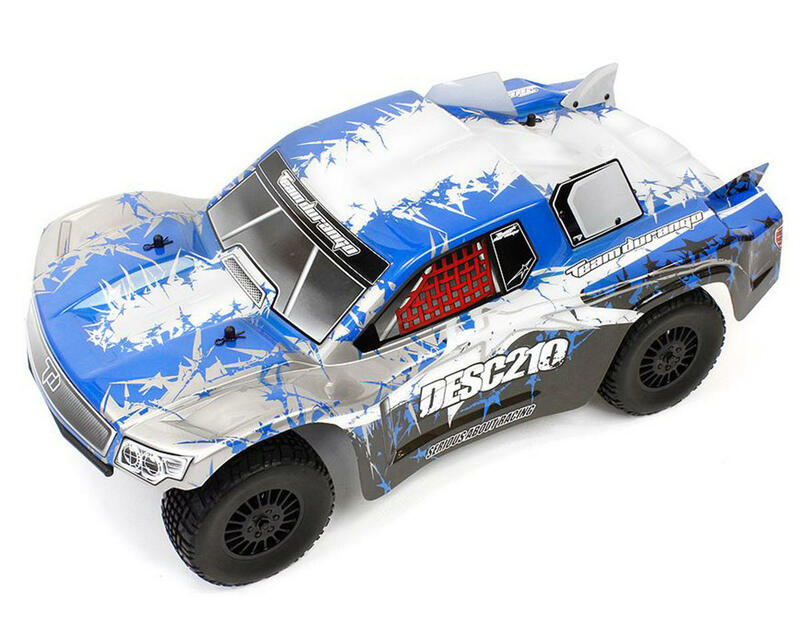 This is the Team Durango DESC210 Ready-to-Run 1/10 Scale Electric 2WD Short Course Truck. Team Durango is building on technology from its powerful buggy line to bring you the most powerful ready to run short course racer yet. Factory assembly gets the DESC210 RTR on the track faster, and once you're there, the 13.5 turn sensored brushless motor will provide you with the power you need win races right out of the box. Control is provided by a 2.4GHz radio and 5kg steering servo. The DESC210 incorporates many of the best features of the DEX210R, like variable motor positioning, and includes them in a short course truck body with even more power. Big Bore shocks, captured CVDs, adjustable camber and a tough injection-molded composite chassis all come standard on this tough short course truck. NOTE: The vehicle shown may not be an accurate representation of the body color/paint scheme you will receive. Paint schemes are selected randomly. The Durango model TDRD03** is available in two different colors, red or blue. If you would like a specific color, please contact our customer service department prior to placing your order and we will do our best to honor your request. 2.4GHz radio with ESC and steering servo. Great 2wd SCT RTR especially for the price. Would be 5 stars in you could allow reverse on the esc (no reverse at all can be used with this esc) and maybe some better tyres. Stand tyres are really, really hard compound and have no grip. I bought this for my son as his first short course truck. This thing is fast! It comes with a great esc/motor combo, no need to upgrade later. I like the shocks, it seems to take jumps very well and lands very nicely. The two negatives I have found are the servo placement is frustrating and the servo is weak, and you need to buy the +2.5 offset wheels to get full turn. From the box it locks the rim against the tie-rod causing that tire to lock up. You have to buy tires to race these things anywhere so not a big issue. I would recommend this truck as a great starter with plenty of hop-ups available to keep improving. Great Truck, comes with extra parts/spares, also can be changed to mid motor setup.